Mike Fitzgerald holds an impressive business and economic development portfolio. Prior to moving to Hawaii, Mike worked for Enterprise Florida where he helped the State create 170,000 jobs, generate $6.2 billion in labor income, build new, small business exports to $1.5 billion, and secure $11.9 billion in new business investment. Now the president and CEO of Enterprise Honolulu, a private non-profit business development organization, Mike leads a group of 10 individuals to assist in boosting the economy and preserve the cultural and environmental qualities of Hawaii through job creation and sustainable development. Mike fully trusts that this can be made possible by diversifying the economy with particular focus on the high-tech industry. Mike Fitzgerald offers a glimpse into the real situation of the Hawaii economy, delving in to the facts that recognize the problems being faced by the State and what the business sector and the government do to avert crisis. Mike shares his insights on why there is a need to focus on economic diversification, environmental protection and social equity, to truly undergo sustainable development. A thought-provoking and intuitive interview, this is highly recommended to those who hold a vision of a prosperous and thriving Hawaiian community. Listen now. MICHAEL T. FITZGERALD is President and Chief Executive Officer of Enterprise Honolulu. Mike has over 30 years of business development experience. 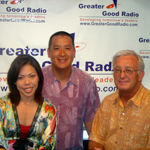 Before joining Enterprise Honolulu in 2001, he was president, Business Development of Enterprise Florida, where his responsibilities included international trade, foreign direct investment, retention and expansion of existing business, targeted recruitment, rural and inner city development, and space commercialization and marketing of Florida. Mike helped the state create almost 170,000 jobs, generate $6.2 billion in labor income, build new, small business exports to $1.5 billion, and secure $11.9 billion in new business investment. He previously served as Director of the Department of Trade and Economic Development for the state of Washington, Vice President of The Pacific Institute, Inc., and President and CEO of Montana’s International Trade Commission. His responsibilities included international trade, foreign direct investment, retention and expansion of existing business, targeted recruitment, rural and inner city development, and space commercialization and marketing of Florida.